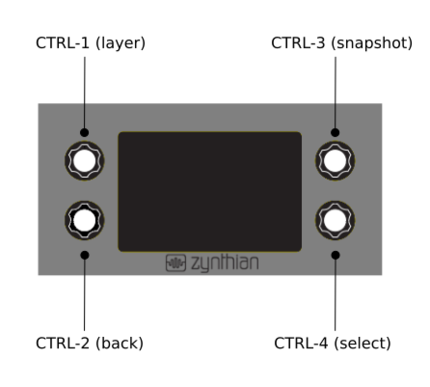 The Zynthian UI is displayed on a touch display and controlled by 4 knobs (rotary-encoders with push-switches). The knobs are used to navigate between the different screens/menus, select options and change the instrument parameters, acting as MIDI/OSC controllers. You can emulate the knob's behaviour using the touch-display, but it's sub-optimal and accessing some features could be tricky. 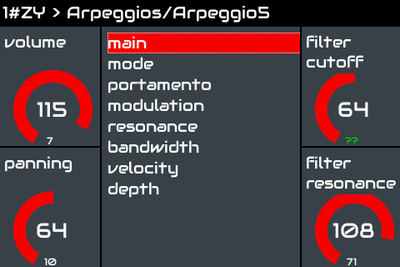 Controller Screen: In the corners, 4 control widgets (one for each knob), with label and value indicator (graphic and numeric). In the middle, a list of controller maps which you can use to change or rotate using the SELECT (4) knob. Confirmation Screen: It will ask you to confirm some operation. XY Controller Screen: It allows to modify 2 parameters at once using the touch interface. Info Screen: It displays info about an operation, like "Update Software", or "Network Info"
Click actions for each knob are context dependent. Generally, the SELECT knob is used to navigate and a short click on it will select an item on a "Selector Screen". Inside a "Controller Screen", short clicks can be used to rotate between layers (LAYER knob) or between controller pages (SELECT knob). "Bold-clicks" are intended as shortcuts for jumping to some specific screens. Clicking the BACK knob generally jumps to the previous screen in the workflow sequence. Snapshot actions are almost global and will work from any point of the workflow. If you short-click SNAPSHOT (3) once, you get the Load Snapshot menu, another short-click and you will be in the Save Snapshot menu. If you bold-click SNAPSHOT then you will go directly to the Save Snapshot screen. When accessing snapshots from Control-Screen context, bold-clicks must be used instead of short clicks and direct access to Save Snapshot menu is not available. These actions are better explained below. CPU-load => A small horizontal bar on the top right. This is a running average of the time it takes to execute a full process cycle for all clients as a percentage of the real time available per cycle determined by the buffer size and sample rate. The green M flag is shown when MIDI messages pass thru the MIDI router. Not all messages are detected. Only CC, Program Change and Note On/Off. When the red V or T flag is shown, your zynthian is working in a degraded state, with the CPU frequency capped to 600-800 MHz, trying to stabilize the system and avoid a system crash. You shouldn't see any of them and if you do so, you should consider looking for a better power source (under-voltage) or using a heat sink (over-temperature). 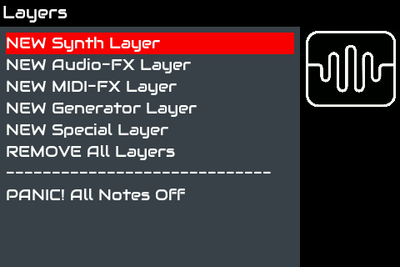 Synth Layer => Receives MIDI note-events and generate audio output. 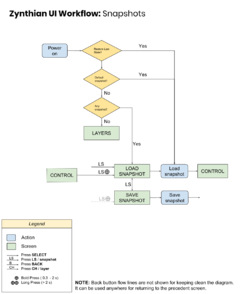 FX Layer => Receives audio-input and generates audio-output. Generator Layer => Auto-generate audio output using some algorithm. 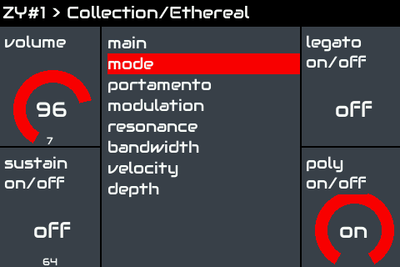 Special Layer => MOD-UI pedalboard, Pure Data patch, etc. The rest of units in a layer normally are FX units that process the audio coming-out from the first unit (root). All units in a layer receive all the MIDI events coming from the assigned channel. 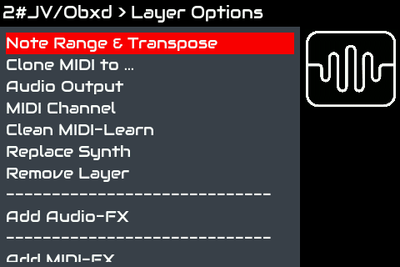 Special layers don't have an assigned MIDI channel and receive all MIDI channels. This is the first screen you should see when you power on your zynthian and no snapshots have been stored yet. 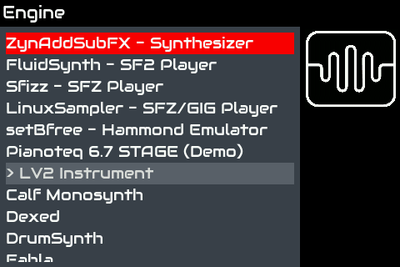 Select New Synth Layer to get started. NEW Synth Layer => Create a new Synthesizer Layer. 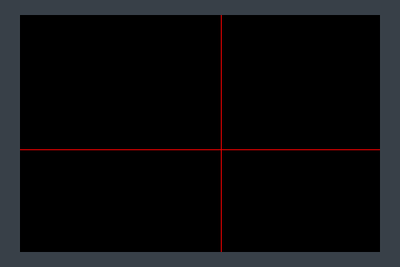 NEW Effect Layer => Create a new Effect Layer that will be connected to soundcard's Audio Input. 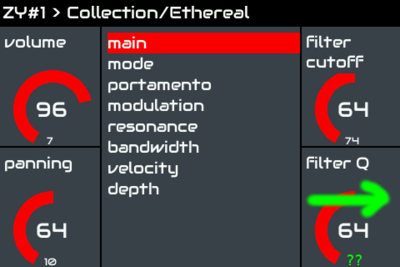 NEW Generator Layer => Create a new Generator Layer that self-generates audio or midi. NEW Special Layer => Create a new Special Layer that will receive all MIDI channels. 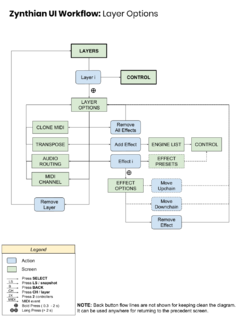 REMOVE ALL => Remove all Layers (Root layers and its associated Effect-Chains), returning to the initial state. PANIC! All Notes/Sounds Off => All notes and sounds are stopped abruptly by sending CC#123 and CC#120 to all channels. The last option, All Notes/Sounds Off, can be triggered by bold clicking CTRL-1 (layer) from the layer screen (contextual action). You can trigger this actions from any point in the workflow by simply bold-clicking twice CTRL-1. Also, you can add a panic-button to your zynthian using the extra pins from the AllInOne circuit. Read this for a detailed explanation about how to add a panic button to your Zynthian. When you select NEW Synth/Effect/Generator Layer, you create a new root-layer (first of a chain), choosing a free MIDI channel for it. You can create up to 16 layers (as many as MIDI channels), each one having an independent effect-chain. Having several layers in the same MIDI channel is not allowed. If you want two or more layers playing unison (like being in the same MIDI channel), you should use the "Clone" feature, that allows you to bind several layers while keeping MIDI CCs and other MIDI messages (Program Change, Channel Pressure, etc.) independent. Transpose => transpose the layer's MIDI channel up and down, by semitones. Audio Routing => route the layer's audio output to available audio input ports, whats allows processing the audio in any way you imagine. You can use this feature for creating your own customized/bizarre FX chains. 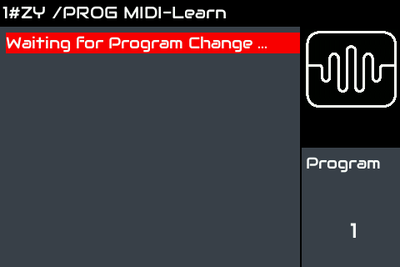 MIDI chan => change the MIDI Channel assigned. Remove Layer => Remove the layer. Add Effect => Add an effect to the FX-chain. Remove All Effects => Clean the FX-chain, deleting all the effects. When you create a new layer, you are asked about which engine/plugin you want to use for it. A list of engines to choose from is displayed. They can be synthesizers, effects, generators or special engines, depending on the type of layer you are creating. When you click on the list, the zynthian logo on the top-right will be animated while the engine is being started. setBfree: This engine can create 1, 2 or 3 layers assigned to the several MIDI channels starting at selected channel, each one corresponding to the upper, lower and pedals sections of the Hammond B3 emulation. 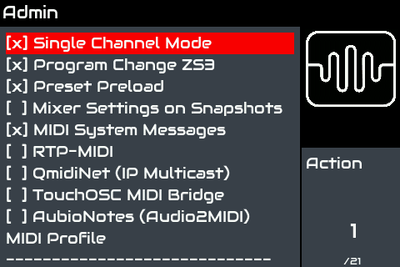 Pianoteq: Only one layer is allowed to be created, assigned to the MIDI channel you choose. After you have selected the engine for a new layer. 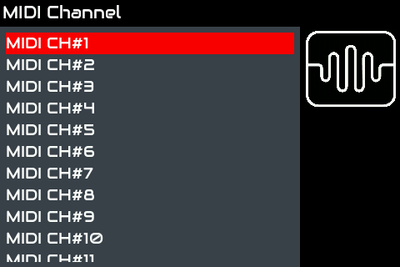 Only free channels are listed. When you change the assigned MIDI channel from the Layer Options. Only free channels are listed. When you clone a layer from the Layer Options. 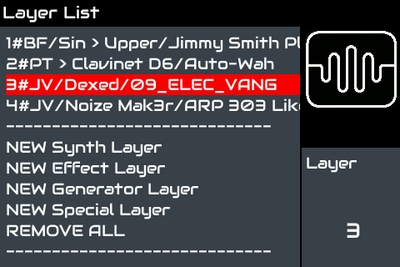 Presets (instruments, patches, or sound designs) for a synth engine are organized into banks. Choose a bank to see the list of presets you can pick from within that bank. Once you have chosen a bank, Preset Screen will be shown. 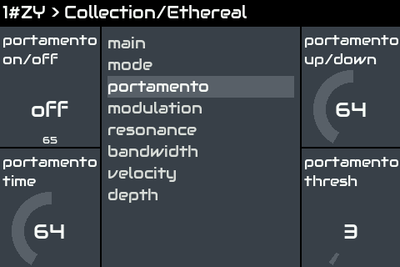 Choose a preset to load the instrument/sound/patch you want and the Control Instrument screen will be shown. If the preload with note-on feature is enabled, you can preload the presets by playing notes. When you do so, the highlighted preset will be pre-loaded before clicking select. You can return to the control screen directly, without selecting any preset, by clicking "bold-back". 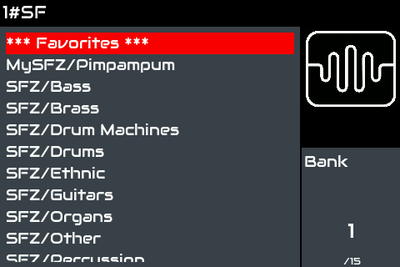 In such a case, the previously selected instrument will be loaded again in case you pre-loaded some preset. This screen is shown after you have chosen a preset. 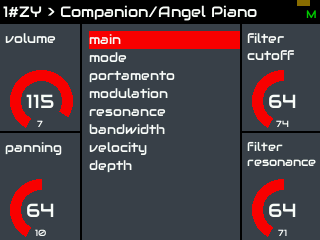 Your instrument is now enabled and playable and you can modify the parameters. Turning any of the 4 knobs changes the values of the synth parameters displayed in the squares at the sides of the screen adjacent to each knob. You also can use the touch interface to change the values. See below. The central list shows the different pages of parameters that you may alter. You can navigate the page of parameters by clicking short-Select to step by one page. If the page list is long, you can "bold click" the Select switch to navigate the list using the Select knob. If you click 2 switches at once, you enter XY-control mode. The 2 controllers you clicked are green and you can choose the desired parameters to control by rotating the controller. Of course, you can navigate the controller pages by clicking select, etc. so you can select parameters from different pages. Once you have selected the right parameters, touch the screen for entering the XY-control-pad (using the touchscreen ala Kaoss Pad). Click back for returning to XY-select or bold-click back for returning to control screen. You can press the Layer switch to step over the layer list. If you bold-press, the layer list screen will be shown. Press the Back switch to return to previous screen. If you press bold-Back, then you will go 2 screens backwards. Snapshots are used for saving/restoring the status of Zynthian. A snapshot includes the full state, including layers, effects, parameter values, MIDI-learning, etc. You can enter the Load Snapshot screen by clicking the snapshot switch. From control screen you have to use bold-click. A second click and you will be in the Save Snapshot screen. You can also use bold-click to go directly to the Save Snapshot screen (not from control screen!). Obviously, before loading any snapshot, you should save one, and for saving a snapshot, you should create some layers, etc. Zynthian UI will use numbers for naming the banks and snapshots. Later, using the webconf tool you can rename the snapshots to something more explicit. By default, snapshots are stored as a single list and bank-related stuff is not shown by Zynthian-UI. If you want to use banks for organizing your snapshots, you simply create a second bank using the webconf tool and the hidden bank functionality will be enabled. When using snapshot banks, if you want to go up one level (from snapshot list to bank list), you must use the ".." entry. The back button will close the snapshot screen. You can save the status as "Default Snapshot". This "Default Snapshot" will be loaded automatically at startup. To delete it, you can use the webconf tool or the command line. If "Restore last state on startup" option is enabled on webconf (and it's enabled by default! ), then state will be saved when poweroff (using long-click select or from Admin Menu) and restored on next boot. This option has priority over the "Default Snapshot". Pressing the Back knob, when you are in the Layer List screen, brings you to the Admin menu. The last item is how you safely power off the Zynthian without corrupting data files. You can navigate and control the Zynthian UI without knobs/encoders/switches at all, using only the touchscreen. You can "emulate" the switches by tapping the controller widgets (squares in the 4 corners of the screen). There are short, bold and long actions, same behaviour than rotary encoders work-flow. The only screen having the 4 controller widgets is the "Instrument Control" screen. Most of screens are selector ones, that only have 1 controller widget. On those screens you can click the zynthian logo (top-right) for emulating the "snapshot" switch, and you can go back by tapping the top-bar area. You can change the controller values by "sliding" up/down over the widgets. (see the green arrow in the figure here) This is the same as turning the knob. If you are using a mouse, the mouse wheel also can be used for changing the controller value. 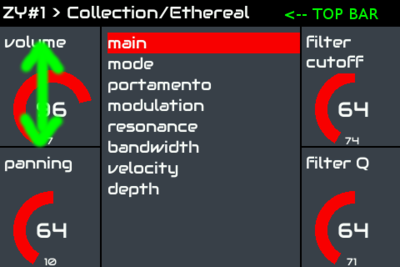 You can map any parameter in the Zynthian UI to a CC knob/slider on your external MIDI controller. I intend to extend this feature to other MIDI messages, but currently only CC messages are supported. Until then, MIDI-filter rules can be used instead. 1. From the control screen, you click the snapshot button. You will be in CC MIDI-learn screen. It’s identical to the Control screen except that all the controllers have a tiny yellow “?? ?” in the bottom. 2. Move a zynthian controller. Its tiny “?? ?” will change to green while the other 3 will go back to normal state. 3. Finally, move a knob/fader in your MIDI keyboard/controller and the binding is done. The new CC number should appear in the bottom of the learned controller, replacing the tiny "???". 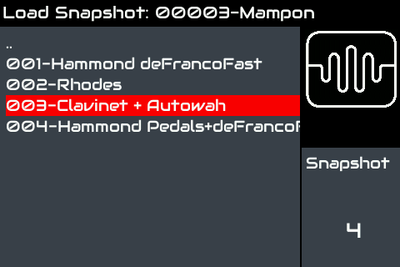 Of course, MIDI-learning configuration, including CC mappings, is stored and restored with snapshots. 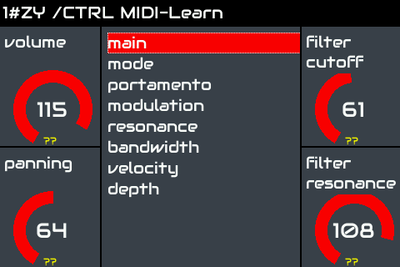 Technical Note: MIDI-CC learning works with all the engines. It uses the engine’s native MIDI-learning capabilities when available. 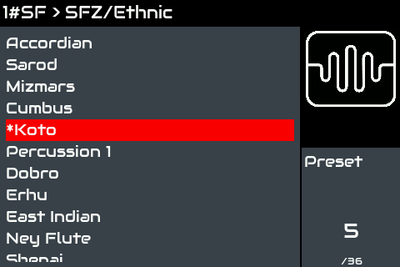 Zynthian’s MIDI-filter mappings are used for the rest. 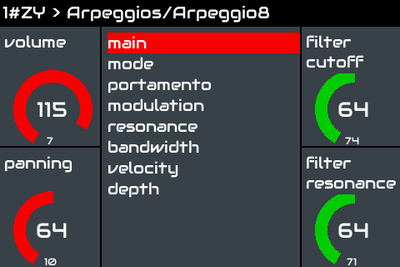 To be more explicit, native MIDI-learning is used for MOD-UI and ZynAddSubFX OSC parameters. 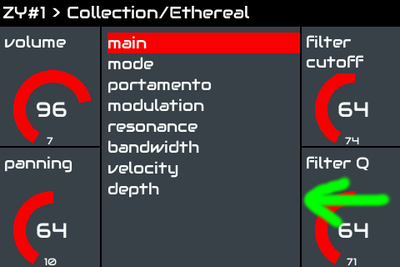 All the other parameters are managed by Zynthian’s MIDI-filter mapping. 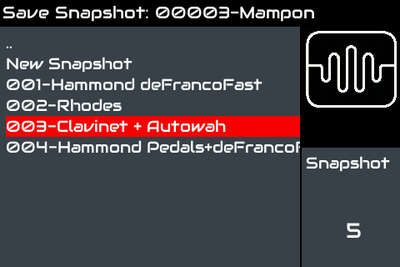 You can map "SubSnapshots" (ZS3) to MIDI programs. The idea behind this feature is to have a fast preset-change mechanism that can be used on stage. In combination with the “Single Layer” feature, it turns Zynthian in a “Stage-Beast”. 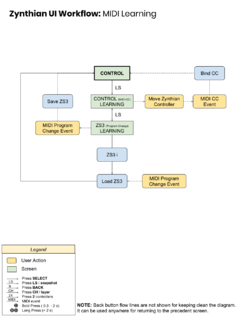 You can prepare a snapshot for the full performance, and use ZS3 for fast changing from a song to another, or between parts inside the same song. 2. Simply push a “Program Change” button in your keyboard/controller and the ZS3 will be stored in memory, associated with the Program number you send. After that, you can recall any stored ZS3 by simply pushing the same PC button again. Of course, the memory-stored zs3s will be saved with your snapshot and restored when loaded again. As you can see, it has sense in a SnapShot context, where a set of layers are defined. Zs3 changing is very fast, as no engine must be started. 1. In the "Instrument Control" screen, navigate through the parameter screen list to get to the parameter you want to learn. 2. In the parameter/controller area, slide with your fingernail from left to right. A green "??" should appear at the bottom. 3. On your MIDI controller, move the desired knob/slider (or a CC-assigned pad). The green "??" should be replaced by a tiny number, and the parameter should change when you move the knob/slider or push the pad. CC-assigned pads can be very useful for on/off parameters. 1. In the "Instrument Control" screen, navigate through the parameter screen list until you get to the parameter you want to unlearn. 2. In the parameter/controller area, slide with your fingernail from right to left. The tiny number, indicating the current CC assignment, should disappear or change. If the parameter is an engine-specific controlled engine, the number will disappear. If the parameter is a hardcoded MIDI-mapped parameter, then the number will change. This page was last modified on 7 April 2019, at 20:04.